I’m still mopping up here after the conclusion of this year’s National Football League, this time to sort a few stats about who played for us in the campaign, who scored what and that kind of thing. Similar pieces I’ve done on this in previous years are here – 2016, 2017. Let’s start with details on who started, came on as a sub and scored in each of the seven League matches we played this year. This information is all set out in the table below. As in previous years, a tick denotes where a player was in the starting fifteen, an ‘S’ shows where the appearance was as a substitute. Here are a few nuggets culled from the above. We used a total of 35 players in this year’s NFL. That compares with just 30 last year and 36 in 2016. Five players started in all seven games (seven did so in 2017 and four the year before that). The five ever-present lads this year were Stephen Coen, Kevin McLoughlin, Diarmuid O’Connor, Eoin O’Donoghue and Aidan O’Shea. Interesting that three out of that quintet were all on the 2016 U21 All-Ireland winning team. A further two players – Colm Boyle (six starts) and Conor Loftus (two starts) – took part in all seven matches. Last year four players did so and the year before that two did. Five other players played a part in six of the seven games this year. These were Fergal Boland (all as sub, the only match he missed was in the opening round when his involvement with the Tooreen hurlers was just finishing up), Ger Cafferkey (six starts), Caolan Crowe (five starts), Jason Doherty (six starts) and Andy Moran (five starts). At the other end of the spectrum in terms of appearances, four players saw just fleeting action for us in this year’s League. Alan Freeman (introduced very late against Donegal), Danny Kirby (brought on against Dublin), Donie Newcombe (a blood sub in the Galway game) and James Stretton (who also came off the bench in Pearse Stadium) all made a single substitute appearance each for us in this spring campaign. Comparing the stats from this year and 2017 it’s clear that there’s a large degree of continuity between the panel of players we used for this year’s League compared to last. That said, a combination of absences through injuries/rehab plus some experimentation did result in a bit of change this year compared to twelve months ago. Players who featured this year but weren’t involved in 2017 were Shairoze Akram (who made his League debut from the bench against Monaghan in Round 1), Ger Cafferkey, Caolan Crowe (who made a few appearances in the 2016 League but none at all last year), Adam Gallagher (back for the first time since 2015), Michael Hall (who was involved in four matches in 2016), Robbie Hennelly, Ger McDonagh, Barry Moran (who, to boot, only made a single appearance, off the bench as well, in the 2016 NFL), Seamus O’Shea and James Stretton (who made his NFL debut off the bench against Galway). Five players saw NFL action for us in 2017 but didn’t appear this year. They were Chris Barrett (recovering from surgery), Keith Higgins (involved with the hurlers but who has since rejoined the football panel), Liam Irwin (now kicking ball over in London), Michael Plunkett (who played for us in the FBD this year but didn’t make the cut for the League) and Donal Vaughan (recovering from surgery). As the table above confirms, our leading scorer in the 2018 NFL was Conor Loftus with sixteen points, the vast bulk of those coming from frees. Andy Moran, with eight points, contributed most for us from open play. After him, our most potent scorers from play were Diarmuid O’Connor (1-3), Kevin McLoughlin (0-5) and Eoin O’Donoghue (0-4). The numbers aren’t included in the table but it’s worth mentioning all the time that we scored a total of 3-85 over the course of the seven games, down slightly on last year’s 3-89 tally. Defensively, though, we were much poorer this year – conceding 7-89 compared to 4-80 last year. That’s about it on the facts and figures relating to this year’s League. Onwards to the championship. anyone know when tickets would be out for Gal match. Good work WJ and much appreciated. Defense stats a bit worrying but Donegal didn’t get any goal chances in the last game which was an improvement. Also Crowe got to grips with a really top forward which was encouraging although the same forward seemed to tire near the end, still Crowe looks to be improving in a similar fashion to Harrison was a few years back. 2 goals conceded v Dublin and Tyrone, time to bring back the sweeper like 2016? Also one way to beat the blanket is defend in a similar manner ourselves. Even Dublin went that route in the league final. OK most of our missing lads were backs but we’ll need them back in flying form otherwise the new backs will have to be trusted. Fantastic statistics here. Also some worrying trends. Getting scores from play is a serious issue, especially from our forwards. Thats why Leeroy will be such a serious loss and why Keiths return is so welcome. When you think about it our defenders have been fantastic for us at scoring. Leeroy just brilliant, Paddy Durcan kicking crucial scores for fun, Boyler, Keith, Barrett and Donie chipping in with crucial goals and points and this league campaign has seen O Donaghue hit four points, a great return for a corner back in his first season. Football has changed and defenders popping up to score is crucial, especially with Mayo. With the exception of Cillian, and Andy in 2017, our forwards have not shot out the lights and we could do with more scoring contributions from our midfield also. We need to bag more goals as well. Teams that hit the net two or three times per game rarely lose. Galway have conceded very few goals in the league which has allowed them to stick to their defensive game plan. Hitting them with a couple of early goals in May would be brilliant and it would be interesting to see how they would react. the change in the full backline was the reason for no goals in Donegal match , look at the goals conceded during the league and see where most of them came from , not rocket science . Agree 100% Culmore – standing out like a sore thumb. That goal conceded against Kildare was shocking. Great stats Willie Joe; did Shane Nally definitely come on against Kildare – seems to have slipped by me? Thanks for that info WJ, you are some man for one man! Compared to last year we have seen Eoin, Crowe and Adam emerge. Coen, Conor, Hall and Boland are all a year older too. Maybe young Hanley will make an impact or Freeman who wasn’t around last year either. Will that be enough? You would have liked to see another mobile midfield option in the mix and at least one more out and out scorer, especially someone with a bit of pace. It’s all to play for anyway, here’s hoping for another long season ahead! The only one with midfielder attributes is Diarmaid but he’s not robust enough for the aerial stuff. Could be very useful as a 2nd half midfielder when game loosens up. Leroy did a serious job there against Rossies in drawn game but that was a mad game all round. Besides that Donie after a few false starts did get fairly good on occasion as a mobile midfielder. Gibbons seems to be off the radar again but he’s mobile and can score. Had a mare v Dublin in league 2017 but that’s only 1 game and it was a day Mayo were very poor. Unfortunately despite age he’s missing big game experience but bucket loads of club experience in midfield position has to be worth something. Hoping Seamie and Tom stay fit. Bit puzzled by that scoreboard in the caption above. Is it reading Donegal 0-12 Mayo 0-13 ? It was never that score at any stage the last day was it? The key stat is the over reliance on AM for scores from play in the forwards. Often the other main scorers from play are Keegan and Durcan. AM is 34 – we need another AM…and quickly! Good spot, Jim Flag! That was the score they had up at the end even though, as you rightly say, that was never the score at any stage in the game. I guess it felt like a loss from Donegal’s perspective! On the ball there Jim Flag. Well spotted. As sharp as Maurice Deegan or Joe McQuillan I reckon. Jason Doherty only shot 2 points from play in 6 games that really is a poor return.Statistics don’t lie Mayos scoring from play is shocking its the main reason we havn’t landed Sam. Our scoring from play was shocking in last eyar’s league as well. It wasn’t an issue for us come August. I wouldn’t be worried. Statistics don’t lie, but they don’t always bare all either. One of the reasons for the low scoring return from the forwards is that they don’t spend enough time close to the opposition goal – if a forward is not in the scoring zone he is not going to score. We seemed to be obsessed with hard working forwards – Diarmuid, Kevin Mc, Jason, AOS even Cillian spend more time tracking back and in our own half than in the opposition half. How many times have we seen Andy win ball and no support within 20 meters of him. We have to commit more players forward. Well said, South Mayo Exile. Tell Rochford. Looking back at Mayo,s management at present, we have a serious problem and nobody wants to admit it. I went to see Mayo training last Monday. I have not seen a Mayo team train since James Horan took over and this was in his first year. WJ made a statement about the beast from Galway on his faults etc, sure I accept that, but we have a beast as we thought in our team until I saw him being dragged along the ground in Salthill , like you would see someone pull a dog away from fighting. At least the beast from Galway can score, ours cannot. Have to agree with you there True Grit , our forwards dont score from open play anymore because they dont know how to kick a football anymore , get back to the basics of catch and kick and get a fullback that can catch a ball over his head and stop the messing of bringing on subs with minutes/seconds to go in a game . I agree with Culmore and True Grit. I’ve been calling for a coach to coach the forwards for years now. We can’t keep depending on defenders to score for us. @Stephen Cowley, it could be a long few weeks! If our management team are so bad I wonder how we managed to beat Kerry for the first time in the championship since 1996 last year. I also wonder how we managed to get to two All-Ireland finals in the last two years only losing to best team seen in the GAA for the last 30 years by one point last year and after a replay in 2016, again by one point. If we can’t score I wonder how we managed to score 1-16 in last year’s final, only the second time in the history of the GAA that a score as high as that didn’t come out on the winning side on All-Ireland final day. I wonder what the management teams of the other 30 counties are doing so if ours are so bad. Just to add, Damien Comer is a forward, with a forward’s instinct, so you’d expect him to do his best work in terms of scoring like Andy Moran does for us. Aidan O’Shea is a natural midfielder and does his best work closer to the middle of the field, again which is what you would expect. Have we room for improvement, of course we have, I think the biggest area we have to improve on is our team play in the final third of the field. We need to be more clinical and ruthless in that regard. In the big games Dublin are probably at the stage where they are doing 95-99% of things correctly. We have probably got to the stage where we are doing 90-95% of things right on All-Ireland day. Can we find the extra few percent, that’s what we all want to see. True Grit – I’ve deleted that bit about your observations on the training session as (a) you shouldn’t be posting stuff like that here and (b) you can’t use this site to take cheap shots at named members of the management team. So you think our training methods aren’t great, eh? Incredible that we keep getting so far in the championship then, isn’t it? We must be the luckiest team of all time. @truegrit that poor form saying Buckley brought us nowhere! We were within a kick of a ball of Winning an all Ireland played some great football in the process while another 30 counties watch on wishing they were in our shoes! I’d be surprised if anyone could just wander up to a training session come championship time and have a look. I should know,I tried watching a training session during the league a few years back,and was politely told to “move along please”. @True Grit – I don’t know the man, but if Buckley wasn’t bringing us anywhere why would he be kept on for so many years across 3 different managers? The county board would get pretty sick of paying his expenses if he wasn’t offering anything constructive. If you want to criticise our forward play based solely on the league fair enough but our forwards were excellent over several championship games last year. I remember several brilliant team moves resulting in scores last year. Over the last 6 or 7 years, we have been considerably better in championship than league so I would reserve judgement until the season is over. If we crash and burn in championship then management deserve criticism. True Grit, how come we managed to put up some big scores last year – Derry, Clare, Cork, Rossies (replay)? Extra time in a couple of those, but the full time scores were still impressive and most of the forwards were picking them off: Cillian 5 against Cork, Andy 4; Andy and Cillian doing a double act against Kerry, after a sublime ball in by Loftus. And so on. But even if we win a future match by 11 to 10 and no forward scores? So what? We are a fluid team that can take scores from 1 to 15 (if Robbie is playing), and prevent scores from 15 to 1. I made a suggestion in the past that our best season taking scores was 2012 championship when Cian O Neill was coaching… and that although Buckley is a top coach, O’ Neill better at the forwards aspect. However Kildare against us a few weeks back took poor shot options and had a high wide percentage. On the same day we were quite efficient. So I’m now saying my previous position was wrong. Get good forwards into good positions and they will score. Some players do it from ridiculous angles, our Andy, Paddy Andrews and McBrearty but most scores come from better positions on the pitch. Dublin had rehearsed using the wings v Tyrone but if they missed the first few they might have fallen into the trap except the wonder goal knocked the stuffing out of Tyrone. Expect Tyrone revenge on Dublin this year and maybe us too if they get near us. O Neill came up with a great kickout strategy v Kerry in replay last year, management came up with the Alan Dillon playing full back plan to beat Tyrone a year previous. I think we’ve a top management team, ride our luck in the league and sometimes back door and finding just 1 or 2 new stars a season would be great. That hasn’t really happened other seasons Harry and Diarmaid being the exceptions but hopefully we get more joy this summer with EOD looking a very fine footballer and Conor Loftus having a X factor management can hopefully figure out how to harness. The Tyrone 2016 game was not our management tactics winning its was us being very lucky to encounter Tyrones worst ever shooting from decent positions. The blogger Dont Foul proved quite convincingly that it was Tyrone missing chances and not us controlling the game. Btw it wasnt our defensive effort forcing those misses either. Jaysus lads we must be okay at scoring. Dublin are often been talked about as one of the greatest teams of all time. A free flowing mobile free scoring team. If they are all that, and yet consistently struggle to score more than 1 point more than we do surely we cannot be as bad on the scoring charts as some of yea are suggesting ? Sometimes I wonder how the next All Ireland might end. Imagine it’s us and them, yea Dublin. If they get a point in front with 23 minutes to go, they will put their Olympic ground wrestling team in to action. That’s 23 minutes normal time and we’ll say 5 additional minutes. 28 minutes of all outfield players wrestling on the ground. Of course Vladimir Putin Gavin will have shook hands with Rochford with the 28 minutes to go knowing the game is in the bag. The linesmen will be saying that they didn’t see anything unusual. Sure it won’t be unusual either, isn’t it goin on a few years now. Whelan will be on the sunday game hailing the Dubs and saying that mayo didn’t go for it when the game was in the melting pot. Its no wonder they have a former boxing world champion in their backroom team. They’ll surely ask Mcgregor to come on board with them now. He could perfect their wrestling and teach them how to really choke the life out their opponent. Yes our shooting is bad so far this year but how many training sessions with the full squad have they had? There is a big game the 13th but so many teams after looking for revenge after that one. This will be the toughest championship in years for our team. Think if we meet tyrone later on we are in trouble they look to have our number. Galway battle first i know but plenty of battles after. Lets hope theres one last push in these guys because time is running make no mistake. Its the same EVERY year, play poorly in the league and some posters/fans looking to get rid of certain coaches, managers etc. Pulling stats to back them up, its becoming increasingly annoying. Everyone knows we dont give a fiddlers about the league, had’nt kicked a ball until January….after a team holiday I might add.Yet, since 2011 we have been a top 4 team, since 2016 we are a top 2 team. Beaten everyone bar the Dubs since 2016. Last second of the league in ‘13, Cillian hits a monster point from the sideline to keep us up, we were all but relegated, yet we end up in AI final. Its tiresome coming on here and seeing the same negative crap written after a league. Our team and managment should only be judged on our championship performance, end of. Also, we probably played more championship games than any other team last summer. So managment were right to give players an extended break…they’re not machines. Galway, Monaghan, Roscommon played very little football last summer and were knocked out the 1st of August at most, that gives teams like them ample rest before this years league. All of them teams targeted the league in a way we did’nt. I expect us to be on a far more even keel come May 13. Revellino. Thats a good one. Well said. Tyrone dont have our number. Complete opposite. We are the last team they want to meet. A bogey team for them. Even in a final with the curse hanging over us we would take them out. If only it could be them awaiting us in a final one year. Well said, Mayo Dunphy! Agreed also, Jim Flag – I’d say we’re the last team (well, aside from the Dubs) that Tyrone would fancy meeting at Croke Park in the latter stages of the championship. We were not lucky to beat Tyrone in 2016. Yes they had chances towards the end but that was because we choose to defend our lead and allowed them on to us. I felt we were on the front foot that day and were marginally the better team. Remember the context also; we were (bizarrely) big underdogs that day and it was something of a ‘big shock’ that we won. At no stage in that game did Tyrone ever look like justifying their massive favourites tag. Anyhow if we take that logic does this mean we were ‘unlucky’ to lose 3 finals to Dublin by a point as we missed some easy chances in all of those finals? In light of our lack of options in midfield would Conor O’Shea not be a viable option in midfield? What do Breaffy folk think? You sound like you need to buy a Galway jersey and come out of the closet altogether. Nobody is forcing you to shout for a team you dislike so much as you seem to dislike Mayo. And don’t forget, these are amateur players, they’re not paid to entertain you or I. Poor True Grit. Would ye make up yere minds please as to where he think he’s from. He was a Roscommon man a few years back, a Galway man now. Fwiw, all we can go on is current form. Given our home form, well it has to change drastically. anyone know when the sky fixtures will be announced? I’d say they might go for the Galway game. Was wondering the same mortified and is our fixture then open to a Saturday night slot like 2016? I see Prenty has stated MacHale Park attendance is 28,000……since when was the max dropped so low? Even with 28,000 there would be gaps behind the goals…. Seems a little ridiculous even allowing for the ott health & safety rubbish of the modern world. 10k in stand , so 18k between other three areas of the ground. Sky will be looking after us if we go the qualifier route. In any case, here is my reading of our schedule for this year – assuming we win all games. This shows a fairly compressed but doable calendar, certainly easier than our schedule last year. Indo has an interview with AM in tomorrow’s paper (with Colm Keys not Breheny). Re the Capacity of McHale Park, contrary to the article in the Indo, be it from Martin Brehney or John Prunty.. The very recent IRFU attempt to bring the 2023 Rugby World Cup to Ireland, state’s that the Capacity of McHale Park (one of the potential venue’s) is 38,000 All Seated…. Maybe it’s a misprint,… Do any of ye remember the complete disaster of a mix up, with seats in the stand, the last time we played Galway in 2016? … When I hear announcements about the attendance at match’s, I wonder whether I should disbelieve my ear’s or should disbelieve my eye’s….. I’ll put it this way, If McHale Park can only hold 28K… Pearce Stadium Salthill couldn’t possibly hold 15K. Totally agree leantimes. Furthermore, why isn’t there a place on the worldwideweb you can look up attendances for provincial games in the past , is there even a record kept . What was the attendance of 06 connacht final , 08 one too? Dave, Martin Ashford, & even WJ, is annoyed. I don’t mind that. We are on here to air our views in a fair and constructive way. [Deleted]. I still don’t know why Tyrone seem to get hyped at this time of the year, almost year on year. Disregarding that horror show in the league and we have their number. They’re one of the few teams I always feel confident about beating when we meet in Croke Park. We’re at our best in Croker, it suits our game and negates any advantage blanket defence teams have over us. Now a qualifier or super 8 game against them in MacHale Park and I wouldn’t be as sure, but still fairly confident we could take them (same with this particular Galway team, who are almost a clone of Tyrone). Sean Cavanagh will also be a huge loss to them this year. I’m not sure where he’s gone actually, maybe someone should check inside Leeroy’s pocket? Surely that piece about MacHale’s attendance is a misprint? Or has H&S really got to that stage? There are grounds in a much worse state than ours that don’t seem to suffer from attendance restrictions. Mayo v Meath on now rte 1 1996 final…feel like crying..so near that first day. True Grit – your first two sentences were fine … and then. Just to be clear – and you’re posting comments here long enough not to have to be told this – this place isn’t somewhere to go to when you want to take a pop at people, be they players or members of the management team. None of what I’ve had to delete from your comments could be called either fair or constructive. Surely the capacity of Machale park can’t be restricted to 28k?? Christ I hope every player gets through the weekend club championship games unscathed. Diarmuid limped off last weekend’s club league game so let’s hope it won’t curtail his preparations over the coming weeks. Galway doing everything right in an effort to have all of their players available and a gameplan perfected for May 13th. How many collective sessions are we likely to fit in given players were given the week off after the Donegal game and then back to the clubs for league and championship games?? It feels a bit ropey considering so many players had also been out injured for our national league games. All we can hope is that there is sufficient time to prepare properly and perform to the highest standards in five weeks time. Corick Bridge. What is wrong is they cannot get a Mayo Senior Football team to win an All Ireland. Even just once. We are great at giving out the praises, but by God we don’t like to take any kind of blame for our failures or mistakes. We could list more mistakes and blunders made than all the good things we have done. They say a man that never made a mistake never made nothing, but when we keep making the same mistakes time after time its time somebody said something. We spend our time giving out about Dublin and all the things they did,etc,etc, but I salute Jim Gavin. I will say he will end up as the greatest manager of all time. Why? He is a man who is not afraid to make changes as he sees fit. He plays each team he meets with a plan to beat them. We seem to have the same plan regardless of what happens in a game. Just to say look at the League game against Tyrone. After 10 mins it was easy to see what Tyrone were doing, and we did not change a thing, Could we not have put 2 big men into the full forward line and pump a few high balls in to see how would the Tyrone backs handle it, but no we kept playing this pass back and forward and hold onto the ball. In fairness Pat Spillane summed it up on the Sunday game. 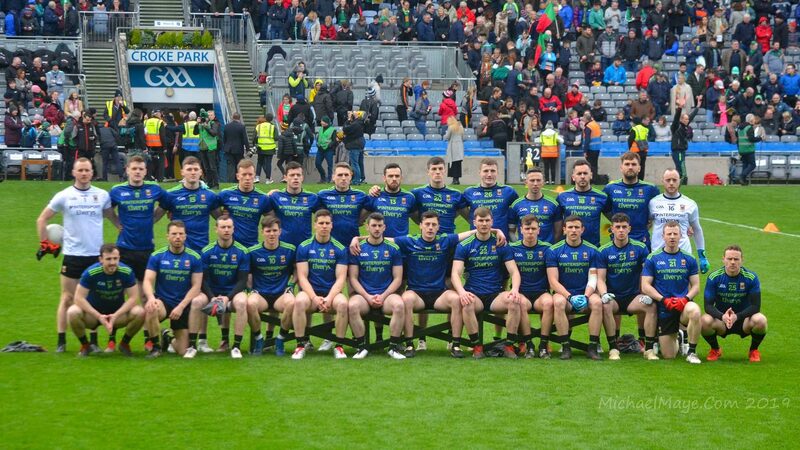 Imagine we had the best support in McHale Park outside of Croke Park and to think we keep coming back to see the same results, another defeat, and what do we hear, the same old long playing record, wait until all our stars are back. I have not critised any person or named anyone, so let us give our opinion. Anything wrong with that? One of the greatest improvements with AOS is his anger management. As a young man he reacted to provocation and walked on occasion. Now nobody is under any illusion but that can handle himself, but given how little change he gets from refs with regard to frees, he could get a red for looking crooked at somebody. He deserves great credit for the control and sacrifice he shows by nor reacting. Reacting is a selfish reaction, the team pays for it. Guys, RE the post photo above, just to clarify. I took the shot at the final score, but by the time I’d the shot framed the score started going down for Donegal. I think the scorekeeper was a bit peeved at the result! The stand in March Park was reduced as well. The stand was of pretty poor design which didn’t originally have the walkway going through the middle that it has now. So all the bludgeoned seats ok the far side are ones moved from the stand. It’s a pity they don’t try to increase the amount of “bucket” seats on the far side as well to be honest. 28k isn’t really what can fit inside. I’d say 40k would be comfortable to be honest, but facilities such as toilets, exits etc are taken into account, and what could the exits evacuate safely in a certain time. Loads of stadia had their capacities reduced. I really hope this is a sell out. Biggest game since 1999!! Will Mayo TV be covering any of the club games this weekend? Nothing up on their Twitter yet. True Grit I agree Jim Gavin will go down as one of the greatest managers in history.He happens to manage one of the greatest teams in history They have won 14 of 16 available cups during his reign Absolutely astounding In that time only one team has competed with them. One team ran them to a point in 2013 , drew with them in 2015, drew with them in 2016, lost replay by a point, lost by a point in 2017. Come to think of it, that team who competed so well against them must be a good team, don’t you think. The pundits said Mayo’s hard nosed experience was what beat Tyrone in 2016 and though they fluffed their lines near the end the Mayo boys were putting them under pressure. That allied to the clever role assigned to Alan Dillon who played puck for.25 mins in the 1st half was the winning of it. The reason though I fear Tyrone 2018 if we encounter them is they are almost as sore about that one game as we were about Kerry 2014. Their main gripe seems that they think they’re better than Mayo but probably also because we snuffed out Sean Cavanagh and ended his career. Summer 2017 showed Tryone up but they have found a good new forward and have enough class players to trouble any top team including Dub… Harte, Donnelly, Colm Cavanagh, McCann and now maybe Lee Brennan. Only Cavanagh performed in their horror show last year although he should have gotten a red but at least he tried to drag them through the mire. Wouldn’t expect a repeat of that and Mickey Harte is a shrewd operator, only last 2 championship exits could be considered bad days for him, most big games he out manoeuvred his opposite number & some of those AI’s should have gone to Kerry but they had the hex on Kerry. 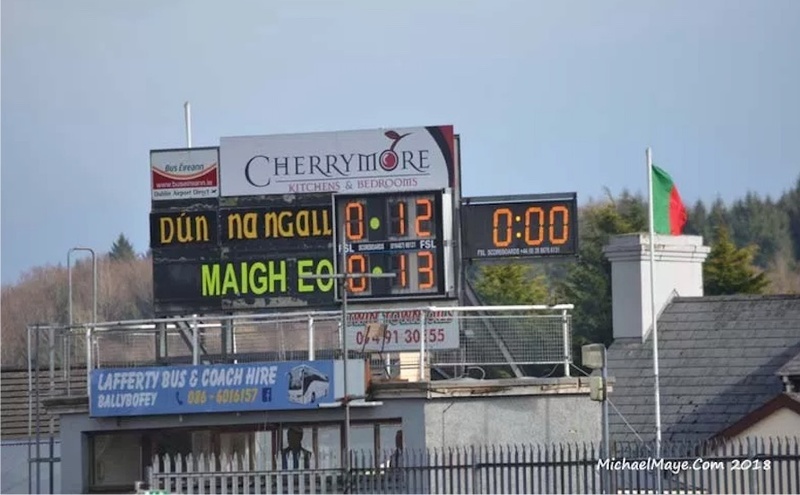 Donegal beat them in said period to win just once. I wouldn’t be bothered arguing with True Grit. Haven’t seen any support for his comments on here. We can all get frustrated early on in the year and once again fret about up and coming replacements… but we know this Mayo team have gone to the well so many times before and come up trumps. Simply not as easy to play on to late September and even October 1st and then have a geographically spread out panel perform throughout the league. We have also presumably a top dietician but lads not getting diners delivered like some claim happens in Dublin. Many here call for experimentation in the League. Sometimes these new lads don’t look great because the team is below par but Loftus, Gallagher and especially Eoin OD have all improved as the league progressed. Crowe looked a carbon copy of Harrison in the last game. I see the Galway game as 50 50 and whoever meets presumably Ros in the final will have plenty to worry about too. But beating Galway 2018 a bit like beating Kerry last year, need to do it to keep them down cause they’re both on the up. That won’t be lost on our players. Hard to take you seriously true grit when you start talking about putting 2 big men in full forward and pumping high ball in on top of them. It appears you never played much football yourself at a high level as that is a classic junior B tactic, and a bad one at that. Here’s one for you – give me one example in the last 20 years of a team who put 2 big midfielders in full forward, at intercounty level, that was successful? Don’t mention donaghy, he was just one big man, and was surrounded by some of the best small forwards in the game like JOD, cooper and geaney. We last saw that kind of caveman stuff from Mayo in 2015 under H & C. It worked well against Sligo (and even Donegal to an extent) when the freakish AOS bullied them and dominated. However, we saw how flawed it was against Dublin in the 2015 semi when AOS was crowded out by top class defenders with no support around him. The style of football was found out that day as not adequate to win big games. Any oul eejit can come up with a plan to hump high ball into a big full forward but there’s a reason it doesn’t work, and why Dublin don’t do it. Contrast that with the football played by Mayo in late 2017. Flowing team movements, long range ACCURATE passing, intelligent inside forward movement (Andy and Jason) and high quality scores kicked and frees won in the scoring zone, through quality approach play that stretched the opposition defence. This system demolished a very good kerry side in an all Ireland semi and went so close against Dublin. We were let down by inferior substitutes to Dublin in the last ten minutes of the game. The quality of play produced by Mayo in the last 4 games of the 2017 season is the best quality football I have ever seen a Mayo team play in my lifetime. I would challenge anyone to dispute this. If we can replicate this again in 2018, and develop a couple more high quality individuals to come off the bench and sustain that level late in big games, we won’t be far off. Larry Duff… Not taking sides, but I can think of the 2009 All Ireland final.. Kerry played Kieran Donaghy and Tommy Walsh in full forward versus Cork and it was a success… However the same personell and the same tactics was not a success in the 2008 final versus Tyrone, where the McMahon brothers (Joe and Justin) kept the big men quite…. Mayo versus Galway in the 2009 Connacht Final versus Galway the twin towers of Aiden OShea and Barry Moran, was a success…. Sometimes it can work, sometimes it doesn’t work… But whatever game plan you come up with, I don’t think you can put all your eggs in one basket, variety, keep them guessing, is what you need…. In an earlier post someone mentioned Tyrone in 2016… In my opinion, that was the match where Mayo were very very lucky…. Tyrone missed virtually all their free’s, depending almost totally on goalkeeper Niall Morgan… Now I have seen Niall Morgan on day’s where he was mercurial… When Niall is Hot, he’s Hot, and when he’s Not he’s Not… We were lucky Tyrone played Mayo on a Not day for Niall Morgan… Another thing is that, It wasn’t a tactical masterpiece by Stephen Rochford.. True Alan Dillon did cause some damage in the first half, but Joe McMahon didn’t know what to do at all, and stayed in the full back line, marking nobody. .. It was a strange move, very like the time Tipperary hurling team, had Ace Full Forward Larry Corbett marking Killkenny half back Tommy Walsh… Alan Dillon was not marked at all, and Mickey Harte took no action until half time, bringing on someone else to mark Alan Dillon, but by which time Stephen Rochford had replaced Alan Dillon… Mickey Harte made very very bad decisions on the day.. Such bizzare strategies might catch your opponents by surprise, but I would suggest that on that particular day, surprise and delight for Stephen Rochford… Tyrone paid a high price for not having an outfield free taker on the day…..Mickey Harte’s decisions and indecision on the day were appalling, he should have taken off Sean Cavanagh, who was completely uninvolved, before he was sent off, Sean just like Joe McMahon had in the previous years a great player,and servant to Tyrone but both were past their best by 2016.. Did any of ye read the Dontfoul statistics on the match? …. Anyways if we were lucky versus Tyrone, luck definitely deserted us in the All Ireland final.. Where Stephen Rochford, definitely got his tactics spot on and Mayo played to the highest level that I have ever seen… A bewildering array of unfortunate events were to befall us in the final, and that’s the match where Mayo were undoubtedly the best team, but with the worst luck imaginable.. Napoleon always wanted lucky general’s,… Your better to be born lucky, than born good, someone once said !… By the way, Galway were very lucky the last two occasions they played Mayo in the Championship…. If Mayo are close to their best, luck won’t be enough for Galway in 2018…. Here’s hoping anyway ! Speaking of good / lucky managers I remember the Mayo v Galway game been played in salthill years ago. It was on the same day as the air display in salthill. A taxi driver said to me in Galway at the time”Jaysus, John Maughan is a great manager. He’s been training the Mayo team in a field beside knock airport for the last 3 weeks to get them used to the sound of the planes”. Lean Times. That was my point. We will never know if it would have worked, but we did not try it. I resent Larry Duffs statement about cave man stuff with Holmes and Connolly. At least they got a Mayo team to win a Connacht title, something our present management did not do so far. You must be a have won a few Celtic crosses yourself. I just gave my opinion. I had my blogs deleted because I said some things about present management. I did not say they were using cave man stuff. If they did we could have won an AI. They say its always grand to play bad and win. That is true for Dublin in 2017. At least they had a free taker with nerves of steel, for the winning point, we don’t have that person. Hahaha thats a classic revellino, re training beside Knock airport . In 2011 the slattery report resulted in many grounds having their capacity reduced but I cant find any numbers online , can see the hyde, salthill,killarney etc but no Castlebar. Has to be out there somewhere . When doing google searches ,I found the rugby wc bid included mchale park at 31k?? Mayo news article in nov 2011 after the slattery report . Where has 4k gone off the capacity since? Throwing cheap shots like that at players, some people here are either world class trolls or genuinely dislike their own county. Either way you disgust me. Agree with Liam , that was a snide dig at Cillian . What about his point from play to level an all Ireland final in the dying seconds? Surely that makes the argument he hasnt the nerve null and void. Cillian O’Connor has had nerves of steel for years. Right back to the Connacht final of 2011 in Roscommon. There was no way we were getting out of there with a result that day but for him. Think of the two sideline monsters in Cork to keep us in Division 1. 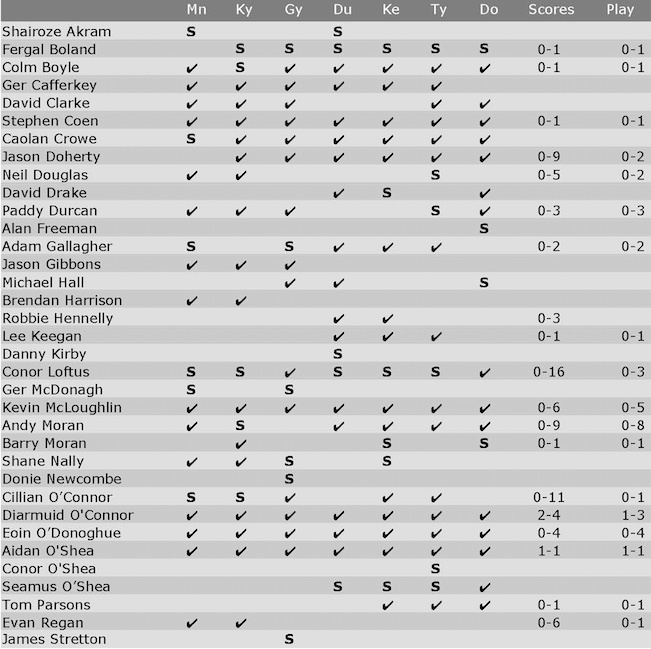 The penalties against Kerry and Dublin at huge moments in those games. All converted under the most enormous pressure. But Cillian is a different player now in open play; he drops deeper than before, gets through a lot more work, covers every blade of grass. I think, and maybe I’m wrong, that this is contributing to his recent problems converting 45s and long-range frees. The man must be wrecked with the sheer level of work he’s putting in, and that must take a toll when it comes to long-range free-taking. A pathetic dig at our captain. Pathetic. i will quote@ mayomark ‘ just my opinion! With the Mayo – Galway match expected to be sold out, it will be some atmosphere. An awful pity though if someone like True Grit gets a ticket and a genuine supporter doesn’t. Got in many a discussion on cillians free taking lately and cant understand some of the comments on him lately. That last free he took was far from a gimme and it hit the post. Would rock have put it over we will never know because he never gets them in them positions of the field. If cillians free taking form has dipped id rather get behind him than run him down,theres plenty in the capital to do that rather hearing it from his own. Sure didn’t Rock miss one from the same distance out bang in front of the posts in the last seconds of the League final last year, gifting the win to Kerry? Not the same pressure as late in an All-Ireland final, I know, and, of course, in the latter Connolly made sure to engineer that ‘foul’ well within Deano’s comfort zone. @True Grit… Overall I’m very happy with Stephen Rochford and his management team,.. I admire him because he takes risks, many of the individual decisions I have disagreed with in the past, but if Mayo are to win the big one, we need to take risks, we need to be a bit unpredictable, we are not Dublin, who can and to be fair to them do, send out a team capable of beating anyone all year round, with the exception of Stephen Cluxton, who is their ONE irreplaceable player, Dublin have over 40 really top class outfield players that would walk onto any team in the country….. As for Cillian O Connor, He did hit the post, in the last few minutes of the 2017 All Ireland final, almost exactly same as Dean Rock did into the same end a few months previous in the 2017 League Final,…. It’s hard to see how you can praise one and criticise the other…. Just to be fair, Cillian also scored one of best points from play, under the most extreme pressure to get Mayo a draw in the 2016 drawn All Ireland final… ‘They,’ who ever ‘They’ are?. might say ‘it’s grand to play bad and win’… I’d say that only works if your opponents play worse than you…. Not a football philosophy anyone, even a Junior B footballer would buy into…But a Junior C footballer with two left feet might approve of their opponents playing worse than themselves…. . Did any of ye ever get to meet a’ Junior B’ footballer? ,… I never did, and I blame Pat Spillane…… He gave Junior B Footballer’s and Puke Footballer’s a bad name…..Back to the Capacity issues of McHale Park, Wikipedia gives it at 38K, an Irish Times report on the possible venue’s for the 2023 Rugby World Cup gave the capacity at 38K, rising to 42K, presumably there in the event of Ireland getting the 2023 Rugby World Cup be further improvements… The only negative issue regarding to McHale Park was the lack of Hotel accommodation in the immediate area… For what it’s worth, I don’t think that McHale Park can hold 38K,… But it’s certainly more than 28K… Probably between 32-34K would be my guess.. I hope it’s not raining on the 13th of May, it’s allot harder to cram 28,000 people into a 32,000…..to… 38,000 stadium if they bring umbrellas with them …. @True Grit – Why are you so eager for us to play a big man full forward and lump high balls in? We tried that for 2 full games against Dublin in 2015 and it didn’t work. Aidan O’Shea was there for much of the 2016 finals and it didn’t work. Barry Moran was there alongside Aidan for the latter part of the replay and it also didn’t work. Aidan and the rest of our forwards performed much better in 2017 when played in their natural positions. Kieran Donaghy is just suited to the full forward role. He has the instinct of an inside forward when making his runs and is good at bringing other forwards into play. When Aidan is on the edge of the square, his instincts are to turn and run towards goal because that is what he does well outfield. However, he ends up getting surrounded by multiple backs and turned over. I’m sure if it was as simple as throwing 2 or 3 big lads full forward and picking up an All Ireland everyone would be at it. We should remember that Dean Rock missed plenty of frees in the drawn 2016 final but as with all sports, things like that get forgotten after Dublin went on to win the replay. The winners do everything right and the losers do everything wrong is normally the mantra when its usually the case that the winners just do a few more things right than the losers do. I think the 2006 Connacht final was the last sell out game between Mayo and Galway…there was around 34,000 there that hot sunny day. https://youtu.be/sDTpTVdEFuw – highlights from that 2006 final. I would rather hand out a 12 point thumping myself yew_tree but I’d happily take your grand finale scenario if it came to it !! Wide ball – agree with everything you said there. True grit and lean times – im not having a go at H & C, they did a lot right, but tactically were inept when it came to the crunch. The twin towers approach you cited as a success for us in 2009 lean times – id argue that was a very weak Galway team, and secondly the tactic failed miserably against Meath in the quarter final that year (admittedly not helped by Dublin Joe), a Meath side who must be up there as one of the weakest teams to ever play an all Ireland semi in the qualifier era. I accept your example of Kerry 2008 with Walsh and donaghy. However donaghy is one of the best full forwards of all time, a brilliant player who’s ability to bring others into the game in the inside line through clever lay offs and decision making was unparalleled, and utterly incomparable to the ability of Barry Moran or AOS in that position. Our guys are midfielders, great ball winners but neither are natural forwards. Many teams have tried and failed to replicate Donaghys role with Kerry in the last 12 years or so.